I've always been attracted to Scandanavian designs. Uncluttered, sleek yet funky, their furniture can also function as art pieces. 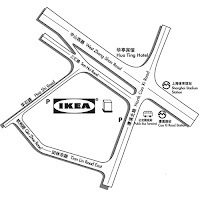 Now since I can't afford upscale Scandanavian designers such as Arne Jacobsen or Erik Magnussen, Ikea is a great option. Now for the warning. IKEA furniture is targetted for the mass market i.e. faux wood, faux leather etc. That being said, it really is value for money. It has so many modern, inspirational, fantastic designs. Its use of color and innovative, creative designs for their unique furniture and accessories really is something to talk about. With this in mind and finding out that much of Ikea's pieces is made in China (no surprise there), the Shanghai warehouse/store was another must on our list of places to visit. We ended up buying color coordinated knives, scissors, plastic utensils, lighting fixtures, children's bibs and basically everything that we could check in without going over the weight limit (hmmm.. I think we might have breached that).